makes, after his wife’s affair. 1. Trying to make your wife jealous with another woman. This is dangerous to you personally, and you’ll likely ruin any attempts at restoring the marriage if you proceed in an affair yourself. What it usually does it complicate everything. Sure, she may be jealous, which may help in the short term, or it may set back your marriage healing by getting entangled in an affair yourself. It’s actually more common than you realize and it just adds fuel to the fire, creating a bigger mess. 2. Thinking that you’re without any fault because you weren’t the one who cheated. Although you didn’t have the affair, no body is blameless. I’m not suggesting putting all the blame on yourself, but humility will go far in your marriage healing. It’s hard to heal, if you think you didn’t contribute something to the decline of your marriage. 3. Blaming yourself completely for their infidelity. but you can’t take all of that on yourself. 4. Getting in contact with her affair partner. It’s logical to think he’ll be a man of decency and stop the affair, but the truth is, if he was decent he wouldn’t be having the affair with your wife in the first place. Don’t try to reason with a liar. Many husbands try this, mine included. But most affair partners only manipulate the situation and will lie to your face if they even tell you they’ll back off. 5. Confronting the affair partner with damaging property, threats, anger or any other method of violence. This is one of the most common mistakes a betrayed husband makes, thinking the other man will back off by force. All this does is potentially land you in jail for harassment. This also backfires because your wife may likely defend the other man and be more upset with you. 6. Talking trash about her affair partner. but if your wife is still ambivalent about reconciling with you, and stopping the affair or not, trashing her affair partner won’t make any difference in her mind. She’ll likely end up defending him and reinforcing her feelings of sympathy for him and you’ll look like a schmuck in her eyes. Even though what you told her might be true. 7. Telling your wife’s family, friends, church community or coworkers about her affair. it on your own. Just be careful to tell only a few trustworthy people who you know will pray and won’t trash talk your wife. 8. Trying to control everything your wife does to keep her from cheating. This is a common mistake many husbands make, and their intention is good. But ultimately it’s controlling, and you can’t force her to be faithful no matter how much you try. She’ll also want to eventually rebel against controlling tactics in the long run anyway. Because nobody wants to feel like they’re married to a controlling parent instead of a spouse. 9. Believing it’s over just because she said it is. Many men are in such shock after discovering their wife’s affair, that they’re willing to believe her when she says it’s over. of taking her word for it is over, for awhile at least. As Ronald Reagan said, “trust but verify”. It’s extremely difficult to end all contact without outside help, so be aware of that. Many people need support groups and professional counselors to break off an affair that became like an addiction. Even if she really wanted to end it, be aware of her own internal weaknesses. The trust will come back, but it comes through consistent actions, not words, over time. 10. Letting her break boundaries without enforcing consequences you’ve set up. This is usually the hardest one for any betrayed spouse to navigate. They usually want to find a way to work on the marriage, so they they’re afraid to set boundaries. And when they do, they often go back on the consequences they’ve set. So the wife doesn’t see any problem with continuing in the affair, even if she’s not admitting it. Many betrayed husbands try to be patient and encourage their wife to be part of the family again, yet she ends up calling the shots on everything. Being patient doesn’t mean being a doormat. Sometimes it’s the harsh realities of the consequences that force a woman to ‘hit bottom’ and realize what she’s going to lose if she continues the affair. The pain of where she is now has to be worse than the pain to change. 11. Badgering her for details and then laying on the guilt when she tells you. First, It’s important to know what you feel you need to know. But be careful how many details you think you really want to know, you may not be able to rid your mind of those images too easily. Second, you’ve got to be a ‘safe place’ for her to even answer those questions. If she thinks every answer will be met with anger and a melt-down, she’ll probably shut down and not open up to you like you need her too. This leads to trickle truth, which is damaging to you in the long run. It’s hard, but try to be as calm as you can. 12. Feeling secure in external changes made. It would be a wonderful thought, and she might even have been sincere when she made those changes, but the pull of an affair can be strong. It’s similar to #9 but being secure in the finality of the affair, based on the exteriors, can give you a false sense of security. This might mean she’s blocked him on social media, changing her number, or email, or whatever safeguards she puts into place. Those are all good things to do, and I always tell women to do them. But it’s a heart change you’re after, not just phone numbers. 13. Losing faith in the marriage and giving up before it healed. Of course this one is a tough one to list, as every marriage is different. You’ll have a breaking point where your patience will run out, and nobody can tell you when that needs to be. But I’ve heard of too many marriages that actually survived, against all hope and appearances that it could. Including mine. Some people give up right before the miracles come. 14. Not seeking the help you need for yourself first. It’s understandable why you’d be preoccupied with everything about her right now. But it’s only going to hurt you in the long run. Take the attention off of her, especially if she’s still acting out, and work on your own healing now. That means getting healthy spiritually, emotionally, physically and mentally. Seek out a good counselor, pray, exercise the stress off. The side benefit is once she sees you taking care of your needs, and your kids, she’ll probably respect you more. This is a good post on this How to cope when your wife is having an affair. 15. Begging, pleading, wooing, and crying for her to come back. This is a tough one. You want to be kind, and wooing her back isn’t a bad thing of itself. But save that for when you KNOW she’s ended the affair and you’re both working on restoring the marriage. Find out what her love language is and show her love that way. But begging and pleading is never attractive and you owe it to yourself to have more self-respect. Plus, you’re showing her your strength is not determined by her actions alone. 16. Not stopping the intrusive thoughts and comparisons that’ll come in your mind. It’s so easy to let our minds wander and take over our emotions. When you find you’re comparing yourself to the other man, thinking of all the ways he might have been better than you… stop! Seriously, it’s likely not true anyway and this thoughts will consume you if you let them. Most men compare their to their ‘manhood’ to others, but us women rarely think of things like that. You might have to stop your mind 100 times from doing this in the beginning, but stop it anyway. 17. Refusing to forgive her, and bringing it up over and over. Did you ever know someone who just couldn’t forgive you for something? It didn’t matter what you did or said, they’d bring it up again later. Don’t be that person. I know it’s rough to let it go, but remember #2 at the top of this list? We’re all without fault and if we think we’re not, we’re lying to ourselves. Work on forgiving her, or your marriage will never survive this. Read this post: What forgiveness is not. And that’s it. 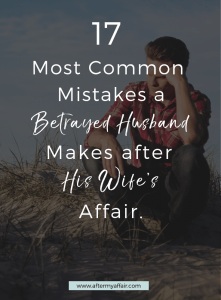 The top 17 common mistakes that betrayed husbands make after their wife’s affair. I’m sure there are many more that could be added to this list. But this is a good start. Keep this post handy. You can get past this. 5 things not to do after finding out about your wife’s affair. When the wife is the one who betrayed her husband.